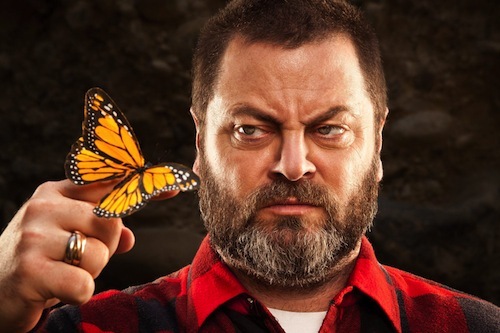 Nick Offerman to bring Ignatius Reilly to the stage. One may, perhaps, safely peruse some of the more tasteful and decent Medieval mystery plays in the quiet of one’s bedroom. (The Second Shepherds’ Play does not count. That heretical travesty is to be shunned, and, where possible, burned.) The motion pictures, of course, wholly escaped the condemnations that Chrysostom, Tertullian, and even that squishy mama’s-boy Augustine leveled so justly and soberly against the so-called “live” theatre. I myself repair often to the movie-house. When the cinema does not refresh my whole being, it refreshes my outrage. Either way, it equips me to continue bearing the peculiar cross that Fortune has dropped upon my rugged shoulders. However, the day is fast approaching when I shall no longer be allowed the peace to enjoy a matinee and a Dr. Nut. The long decadence begun by Euripides, arrested by the Church Fathers, resumed by Corneille, and accelerated by Ibsen will soon catch up with me. No doubt my enemies are already planning to abuse me rather spectacularly in some public forum for the entertainment of the rabble. Perhaps I shall be martyred live on Pay per View, rouged and bewigged as Europa, fatally gored by a particularly large Jovian bull in some unspeakable manner. Breathtaking. I knew you would not disappoint, sir. … as the actress said to the bishop.